The burpee, which is essentially a combination of a squat and a squat thrust, is the ultimate full body exercise, with just four simple steps testing both your strength and aerobic capacities. This is the reason why the armed forces, fitness boot camps, CrossFit practitioners, martial arts classes and personal trainers around the world incorporate it into their training regimens. The combined feelings of breathless, elevation of the chest wall, forced expiration, high heart rate, and legs feeling like lead and the associated lactic acid burn sensation will become rapidly familiar after just a minute of burpees. The benefits of the burpee are plentiful. The burpee will improve aerobic endurance, strengthen both muscles and bones, create lean muscle mass that raises your metabolism and, of course, help keep you fit and healthy. The burpee, and its variations, is a core exercise in any fitness professional’s arsenal. In 1940, Royal Huddleston Burpee, ‘Royal’, published his thesis titled ‘Seven quickly administered tests of physical capacity and their use in detecting physical incapacity for motor activity in men and boys’ as part of his PhD in Applied Physiology at the Columbia University, USA. As part of his research, Royal attempted to narrow down some 300 tests of physical capacity to a short list of tests that could be easily administered to large groups, in minimal time and with little equipment. One test that rose to the top was the Front Leaning Rest (FLR), from the standing position. The FLR is otherwise known as the press-up position. Royal modified the FLR to accommodate his discerning criteria for a physical capacity test and thus was born the burpee. The exercise was popularised in 1944 when it was adopted as one of seven exercises used by the US Army in its new toughening up programme (Raymond, 1944). The burpee is a great full body exercise used in strength training and as an aerobic exercise. One of the greatest benefits of burpees (and conditioning training in general) is that of injury prevention. Nothing aids the skeletal structure more than strengthening the muscles and connective tissue around a specific area. This strengthening naturally occurs through regular training and from an aerobic standpoint performing moderate to high sets of burpees will provide an effective cardiovascular workout too. As an additional benefit, bone density is also improved, which vastly decreases the potential risk of injury in the specific body areas. The pectoralis major (commonly referred to as ‘pecs’) is the fan-shaped muscle at the top-front area of the chest. Impressive chest development is usually the result of having well-defined pectoral muscles. The pectoralis major is responsible for three major actions – medially rotating the humerous (as in arm wrestling), flexing the humerous (as in lifting or throwing) and adducting the humerous (as in raising your arms to the sides of your body). The triceps brachii (commonly referred to as ‘triceps’), the large muscle located on the back of the upper arm, is responsible for the action of straightening the arm. The triceps muscle makes up approximately 60% of the upper arm’s muscle mass. The biceps brachii (commonly referred to as ‘biceps’), the muscle located on the front of the upper arm, is responsible for forearm rotation and elbow flexion. However, biceps are not developed to any significant degree while performing traditional burpees. The gluteus maximus (commonly referred to as ‘glutes’) is the coarse muscle that makes up a large portion of the buttocks area and is largely responsible for maintaining the trunk in the erect posture. The deltoid muscle is responsible for the much-coveted curved contour of the shoulder and is made up of three sections: front, side and rear. The Burpee, although not a major contributor to deltoid development, is still an ancillary benefit to this muscle. The deltoid muscles take part in all movements of the upper arm, including lifting and rotating. The rectus abdominis muscle (commonly referred to as ‘abs’) is the large, straight muscle at the front of the abdomen that supports the muscles of the spine. When performing burpees, the lower back muscles contract to stabilise your body (at ‘count’ two, see below); this has a secondary benefit of stretching the abdominal muscles and developing core strength. The Quadriceps is a group of four muscles that sit on the anterior or front aspect of the thigh. They are the Vastus Medialis, Intermedius and Lateralis and finally the Rectus Femoris. The Quadriceps attach to the front of the tibia and originate at the top of the femur. The exception to this rule is the Rectus Femoris which actually crosses the hip joint and originates on the pelvis. The function of the Quadriceps as a whole is to extend the knee (straighten the knee). The Hamstrings are comprised of three separate muscles: the Biceps Femoris, Semitendinosus and Semimembranosus. These muscles originate just underneath the Gluteus Maximus on the pelvic bone and attach on the tibia. The Hamstrings are primarily fast-twitch muscles, responding to low repetitions and powerful movements. The Gastrocnemius is the calf muscle that is visible from the outside of the body. It attaches to the heel with the Achilles tendon and originates behind the knee on the femur, crossing two joints. The Gastrocnemius has two heads: the medial and the lateral. When fully developed, these two heads appear to form a diamond shape. The Soleus is not visible when looking at the body from the outside as it lies underneath the Gastrocnemius on the rear of the lower leg. The Soleus is most active when doing calf exercises where the knee is bent, such as seated calf raises. The function of the Gastrocnemius is to elevate the heel (known as plantar flexion). The function is the Soleus is exactly the same as the Gastrocnemius: to raise the heel. The only difference is that it works in a different position: with the knee bent. The burpee is a functional, multi-joint, multi-muscle movement that develops strength and aerobic capacity in a time efficient manner. The burpee is an integral part of military physical fitness and many military systems around the world train daily with this classic exercise. All branches of the British armed forces (Army, Royal Navy, Royal Air Force and Royal Marines) routinely incorporate the burpee into their training programmes. There are a number of practical tips that can be used to enhance performance and reduce the risk of injury. It is very important to allow your body time to recover from your daily workouts. Muscle tissue is broken down during exercise but will rebuild itself during periods of rest and recovery. Working the muscles on consecutive days will hamper the rebuilding process. Current convention suggests the body needs 48 hours to recover and adapt to the stress of strength training. Try closing your hands and making a fist to perform the burpees. This way your body weight ends up on your knuckles instead of your palms, thus avoiding the wrist extension motion. Ensure that you do this type of burpee on a padded mat, plush carpet of even a folded towel. Burpees should be performed in a slow, deliberate manner. Rather than bouncing up and down, it is important to maintain full control as you progress through each of the four steps in a burpee (see below). As a rough guide, each step of a single burpee should take one to two seconds. It is important to breathe in during the descent and breathe out on the ascent. Make sure you do not hold your breath and make every effort to breathe rhythmically throughout the exercise. Can be the feeling of being ‘pumped’ as your muscles fill with blood during exercise, or it can be the mild feeling of fatigue as the lactic acid burn sets in. Recognise these sensations and learn to thrive on them. On the other hand, is any sharp pain or spasm, or pain that moves quickly into the shoulders, arms, hands, legs or hips – these are definite warning signs. Good form should put your chest within an inch or two of the floor. There is no specific need to touch the floor with your chest, but aim to form a 90 degree angle at your elbow joint. Your head should be held in a neutral position – this is, not looking forward, up or down at your navel. Looking slightly above your hands reduces the strain on your neck muscles. At the top of the movement the arms should be almost straight, but be careful not to lock or snap them in place. Also, be sure to keep your elbows close to your body and not splayed out past your hands. If your form is good, you should feel a contraction in your triceps muscle. Begin in a standing position, with arms at the sides, and feet a couple of inches apart. At the count of ‘one’, go down to a squatting position, with hands flat on the ground, and arms inside the knees. At ‘two’, throw both feet to the rear, fully extending the legs with knees off the floor, weight resting on hands and toes. At ‘three’ jump back to the squatting position. For some people going straight into a classic burpee may be too much for a variety of reasons. However, there are exercises that can be used to prepare the mind and body for the classic burpee. Although there is a vast range of burpee variations, the basic framework is always the same and brings similar bodily benefits: going from a vertical position to a horizontal one and pulling yourself back again. Alternatively, new exercisers can just perform either squats (to build confidence and leg strength) or squat thrusts. Burpee press-up: the exerciser performs a press-up after assuming the plank position. Knee press-up Burpee: the exerciser bends their knees and rests them on the ground before performing the press-up. Jump up Burpee: the exerciser jumps up as high as they can in at the end of the movement and before beginning the next burpee. Long-jump Burpee: the exerciser jumps forward, not upward. Tuck-jump Burpee: the exerciser pulls their knees to their chest (tucks) at the peak of the jump. Jump-over Burpee: the exerciser jumps over an obstacle between each burpee. Box-jump Burpee: the exerciser jumps onto a box, rather than straight up and down. One-armed Burpee: the exerciser uses only one arm for the whole exercise including the press-up. Dumbbell Burpee: the exerciser holds a pair of dumbbells while performing the exercise. Parkour Burpee: following one burpee on the ground, the exerciser jumps upon a table and performs the second burpee on the table, then jumps back to the initial position. Pull-up Burpee: combine a press-up with the jump or do a press-up instead of the jump. Muscle-up Burpee: combine a muscle-up with the jump or do a muscle-up instead of the jump. Double Burpee: instead of one press-up, do two in a row. This cancels the drive from landing after the jump and makes the next jump harder. Each part of the burpee might be repeated to make it even harder. One-Leg Burpee: the exerciser stands on one leg, bends at the waist and puts hands on ground so they are aligned with the shoulders. Next, jump back with the standing leg to assume the plank position. Jump forward with the one leg that was extended, and do a one-leg jump. Repeat on opposite side. Side Burpee: the exerciser bends at waist and places hand shoulder-width apart to the side of right or left foot. Jump both legs out to side and land on the outer and inner sides of your feet. Jump back in, jump up, and repeat on opposite side. Shitee: starting in plank position perform a press-up, then with hands maintaining position on the floor quickly bring feet forward so that the toes are even with the hands, then return to plank position. Awkwards: begin in a standing position and then drop into a squat position with your hands on the ground. Now extend your feet back (together) in one quick motion to assume the front plank position. Return to the squat position in one quick motion. Again extend your feet back together in one quick motion to reassume the front plank position and perform a press-up. Again return to the squat position in one quick motion. Return to a standing position and immediately jump up as high as you can, raising your hands above your hand. Measure heart rate every 15 seconds until heart rate has returned to normal (record the time it takes to return to normal). Table 2 outlines the burpee standards according to Royal’s thesis research. 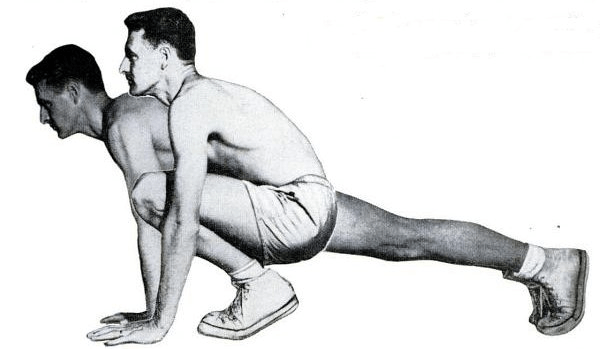 In 1944, the burpee was one of seven exercises used by the US Army in its new toughening up programme (Raymond, 1944). The US Army suggested that even the rawest recruit could do this exercise a few times slowly, but would not consider the soldier fit for the rigours of war until they could complete 40 or 50 in easy rhythm, without pausing for rest. With a time frame of 20 seconds: 8 or less was considered poor; 9-10 was fair; 11-12 was good; and 13 or more was excellent. A muscle that causes motion. A muscle that can move the joint opposite to the movement produced by the agonist. The primary muscle intended for exercise. A muscle that assists another muscle to accomplish a movement. A muscle that contracts with no significant movement to maintain a posture or fixate a joint. A bi-articulate muscle that simultaneously shortens at the target joint and lengthens at the adjacent joint with no appreciable difference in length. Dynamic stabilisation occurs during many compound movements. The dynamic stabiliser may assists in joint stabilisation by countering the rotator force of an agonist. A muscle that contracts to maintain the tension potential of a bi-articulate muscle at the adjacent joint. The antagonist stabiliser may be contracted throughout or at only one extreme of the movement. The antagonist stabiliser is activated during many isolated exercises when bi articulate muscles are utilised. The antagonist stabiliser may assist in joint stabilisation by countering the rotator force of an agonist. Antagonist Stabilisers also act to maintain postural alignment of joints, including the vertebral column and pelvis. For example, Rectus Abdominis and Obliques counters the Erector Spinae’s pull on spine during exercise like the Deadlift or Squat. This counter force prevents hyperextension of the spine, maintaining the tension potential of the Erector Spinae. The contraction of a muscle with movement against a natural resistance. Isotonic actually means ‘same tension’, which is not the case with a muscle that changes in length and natural biomechanics that produce a dynamic resistance curve. This misnomer has prompted authors to propose alternative terms, such as dynamic tension or dynamic contraction. The contraction of a muscle against concomitant force at a constant speed. Diagnostic strength equipment implements isokinetic tension to more accurately measure strength at varying joint angles. The contraction of a muscle resulting in its shortening. The contraction of a muscle during its lengthening. The contractions of a muscle resulting in movement. Concentric and eccentric contractions are considered dynamic movements. The contraction of a muscle without significant movement, it is also referred to as static tension. Requiring air, where air usually means oxygen. Aerobic exercise is usually prolonged exercise of low- or moderate-intensity. For example, a five-mile run at 10-minute per mile pace. Anaerobic exercise is usually short duration exercise of high-intensity. For example, a 100-metre sprint in 15 seconds. Burpee, R.H. (1940) Seven Quickly Administered Tests of Physical Capacity and Their Use in Detecting Physical Incapacity for Motor Activity in Men and Boys. Teachers College. Columbia University, Contributions to Education, No. 818. Raymond, A. (1944) Can We Make Our Soldiers Tough Enough? Popular Science. Feb 1944, pp.57-60 & 203. Record Holders (2011) Paddy Doyle – One of the Most Prolific Record Breakers. Available from World Wide Web: <http://www.recordholders.org/en/records/doyle.html> [Accessed: 05 April, 2013].